I met Waite outside his restaurants at 9:00 a.m. on an overcast Oceanside morning. Waite came around the corner from the parking lot, an impish grin on his face, saying: “Let’s go!” And with that we headed six long blocks up the hill—about two miles—to find his muse. Waite was the first over the farm’s locked gate, hopping it in a single, graceful move. He turned to me, a look of concern crossing his face. “It’s OK,” he said, “I have permission for this.” I smiled, and considered suggesting if he must think of me as a lawyer it be in terms of Hunter S. Thompson’s attorney. First on the docket were the nasturtiums. Waite kneeled, showing me a particularly beautiful little one. “These are the ones every Chef goes for,” he said. “But I want these.” Waite took a large, floppy nasturtium leaf, tearing off two pieces, one of went in his mouth and one of which he handed to me. It was like a little vegetal pepper bomb went off in my mouth. My eyes must have gone buggy. “See?” Waite said. Next, Waite guided us to a block of broccoli plants. He pointed to some tiny florets at the top of long shooting stems. “Try these!” Breaking off a stem, I did. The florets were like sweet broccoli pollen, without even a hint of the bitterness that some cite as their reason for disliking the vegetable. I took a nibble of the stem and it may have been even better. “It’s like candy,” I heard a little voice behind me say, turning around to see 8 year old Josie Girling—with her father, Cyclops’ owner Luke several yards behind—a broccoli stem curling from her lips. And she wasn’t wrong. But Waite wasn’t done. He knelt down, reached to the bottom of the broccoli plant and tore off a piece of the long, large, flat leaf and handed it to me. It looked like a darker, overgrown lacinato kale leaf. The flavor was rounder, more cabbage-like, hovering somewhere between savory and sweet. I looked at him quizzically, smiling. “Yeah,” I nodded. Josie smiled too and took a chomp of her broccoli stem candy cane. Five minutes down the hill, behind the sushi bar at the Wrench, we set about experimenting with Cyclops Farms’ “unwanted” bounty with an eye toward The Whet Noodle’s menu or specials. Waite conceives of Noodle as an izakaya, essentially a Japanese-inflected version of a cross between a British gastropub and a Spanish tapas bar. Essentially, anything delicious goes. Aside from matters of flavor, principle and idealism—Waite’s and Girling’s—there was a solid business reason for wanting to build The Whet Noodle’s arsenal of dishes around Cyclops Farm’s “trash.” Those unwanted, unloved parts of the glory crops—the stuff left behind—were cheap (if not necessarily free). The ingredient costs at the Wrench—glorious sushi-grade fish—is high. Building a big part of the Noodle’s menu around the delicious stuff that other people don’t want yields a much lower cost-of-goods-sold. 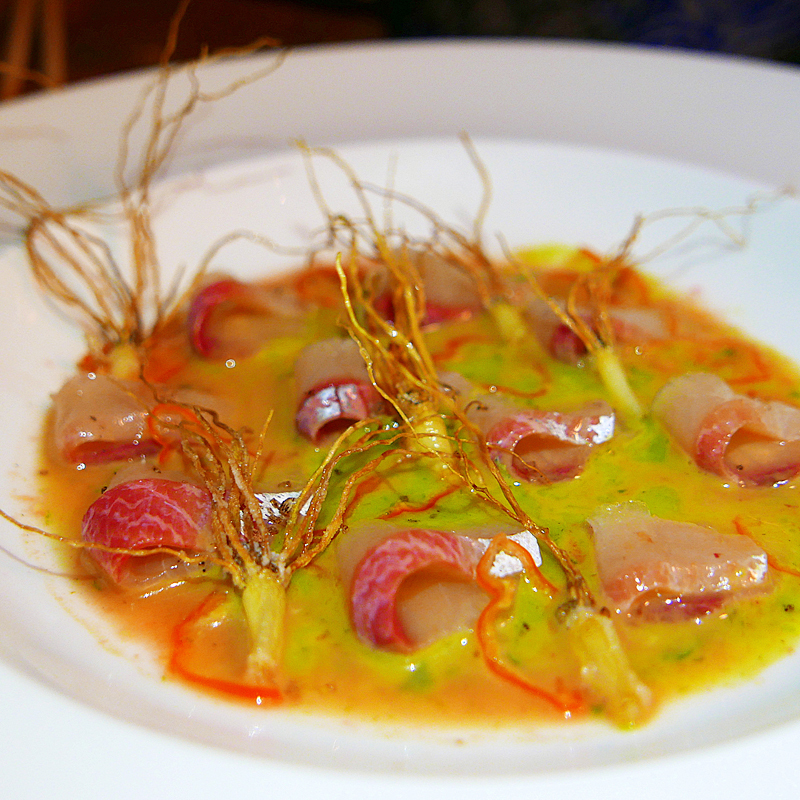 Remember those nasturtium leaves that were “too big?” Puréed with thinly sliced sautéed green onions, a bit of Chinese 5-spice, sugar and salt they became a nasturtium relish that elevated a dish of thinly sliced local yellowtail with curls of nasturtium flower and citrus juice. 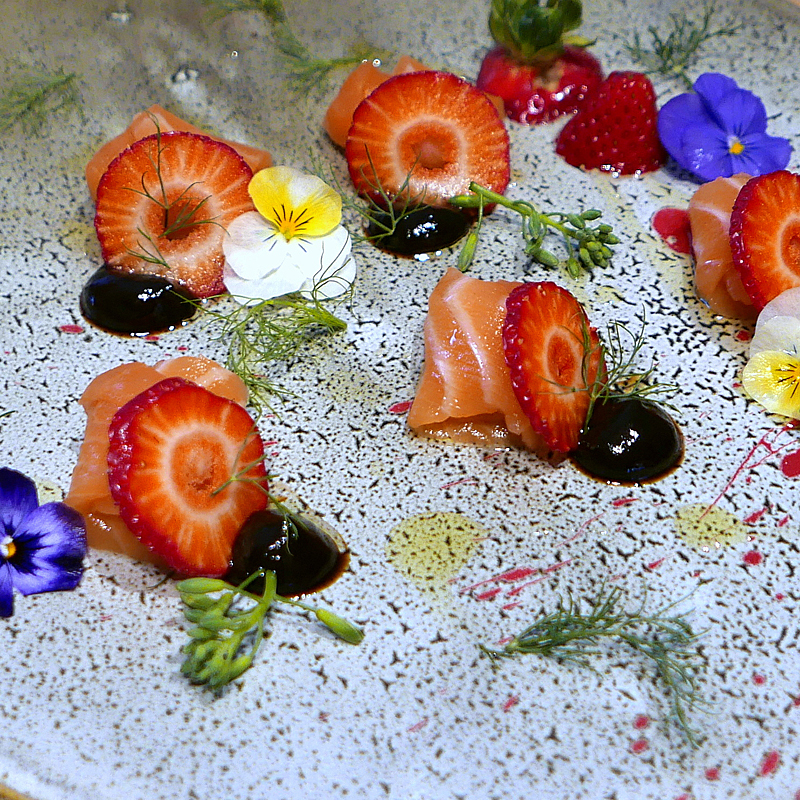 After bouncing a couple of ideas back and forth the dish evolved into a blood tangelo and habañero aguachile of local yellowtail with nasturtium relish and ramp tips. Earlier at the farm, Waite, Luke Girling and I had each confessed to Spam as a favorite guilty pleasure. It was a strange moment to share on an organic farm in the midst of discussions about the importance of using all of fresh, delicious, organic vegetables. It was even stranger developing a dish in the Wrench based on Spam Masubi. When Waite mentioned he had some leftover beet hollandaise sauce he’d made the night before a light went on. “Do you have quail eggs?” I asked. 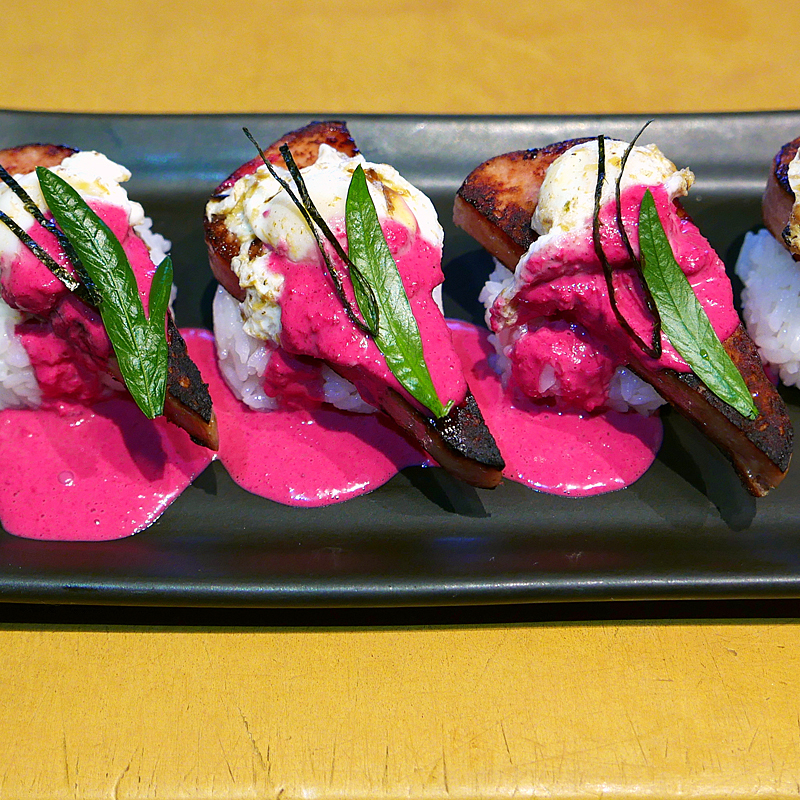 He smiled: “Spam Masubi Beet Benedict.” A dab of Yuzu relish would complete the dish. There is, in the end, more in common between a dish based on Spam and one on the parts of organic vegetables even the Birkenstock-loving chef crowd is prepared to discard. It is a shared conviction that within the unloved and underappreciated lies a key to inspiration. Building a dish around the subtle variations in the flavors of the different parts of the broccoli plant is not so different from building one around the different ways to control the saltiness of Spam. It’s about finding and enhancing the value of the cheap stuff so many chefs discard if they do not outright ignore. It is how one goes about building a Whet Noodle.